Whew, what a busy week! Between busy days at work, making the super secret project and creating part of my dad’s birthday pressie in the evenings, going out to dinner on Wednesday night with friends, and spending the weekend with the family at mum and dad’s to celebrate my dad’s 60th and aunt’s 69th (both tomorrow) I’ve not had a chance to catch up with everything I wanted to! I apologise now if I normally read your blog, but haven’t commented in the last few days, I was trying to play catch up tonight but Windows updater and Kaspersky’s huge update managed to thwart me again – argh! When I wasn’t out working, collecting parcels, stuffing my face, partying or finishing off projects I’m not allowed to share with you, I whipped up a cover for the new toy I bought my dad for his birthday. I was hunting through my stash for the best fabric, and came across this home decor weight print I’d bought in a moving sale last summer. It’s an orphan print, as I seem to remember it was on a table with other orphans, but I discovered just underneath it a nice Clarke and Clarke light green polka dot which matched perfectly. Hope everyone’s been having a great week/weekend, and I hope to have caught up tomorrow! woohoo – that kindle corner is fabulous! as are all the goodies! blogging is seriously terrible, i see all this fabulousness and I'm so tempted.. I'm trying to behave though.. trying..
love the kindle cover – very sophisticated – and now i'm going to have to get the half moon modern range – it's fantastic! You have some great stash builders there. 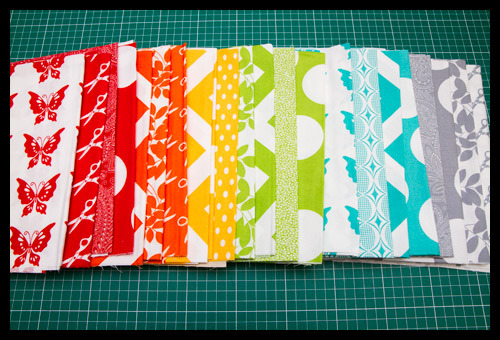 I too bought some Half Moon Modern fabrics and some of the Kokka prints. Don't ever worry about not commenting on a blog all the time We all know you love us and we love you too! Wow, some lovely fabrics. 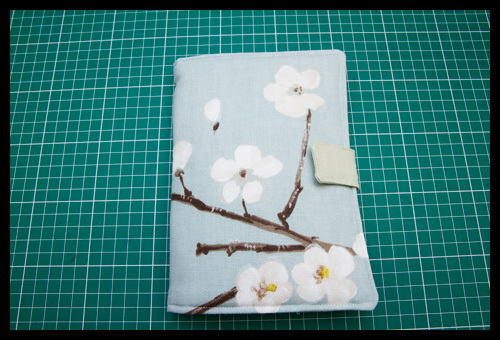 I particularly envy you the fabric with Spring blossoms – gorgeous. The Kindle and cover are such thoughtful presents. I bought 'him indoors' a Sony ebook two or three years ago for Christmas. He uses it EVERY day and he tells me, it's the best present he has ever received. I liked his so much, I got one too. The ability to enlarge the text is great – eyes not as good as they were! More yummy fabric Katy. I was in to Kindle covers too before Christmas, their popularity is growing year on year. 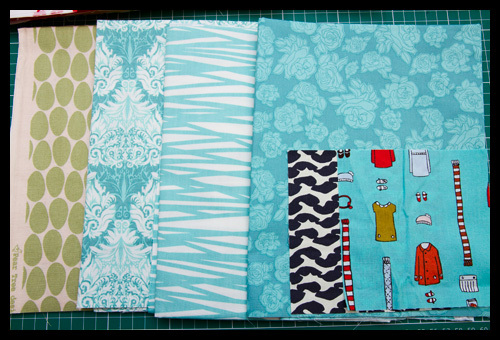 Fabric, fabric and more fabric! You are going to sit there and wallow in it happily until you decide what to do with it all. While reading a Kindle in a super cover! I love the Kindle cover, a great idea. What a stash!!! 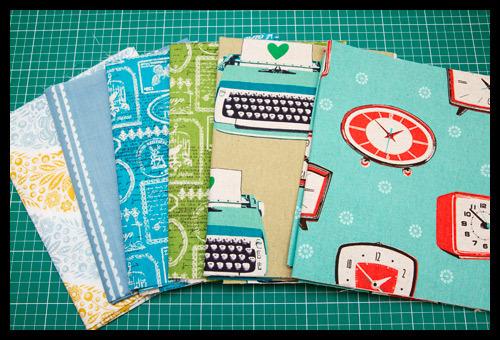 I think my favorite fabrics are the typewriter and the dogwood. What a great carry case for your Dad's gift. Very clever. HI everyone, as the Dad in question I can say that the Kindle cover is excellent as is the Kindle within. I got quite a lot of money for my birthday and I think I'm going to splash out on an iPad for my photography, so maybe…..please!! 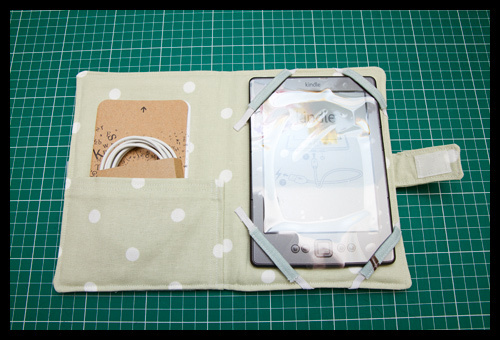 Ooh, that looks very much like the Kindle cover I made myself (actually, I've made three – I like changing them out). Nice job!